Abstract: Inspired by the entanglements of the Cosmos, this essay is a response to the JSE special call for papers on future casting sustainability education. The author’s approach reflects an integrated view of humans, moving beyond Anthropocene, capitalism, and Donald Trump to the idea of the Chthulucene, an era of reciprocity amongst human and more-than-human. In challenging times, such as this, sustainability education can look towards the future through hopeful pedagogies of interconnection through reciprocity, storytelling, and embracing the bio-cultural diversity of Earth. 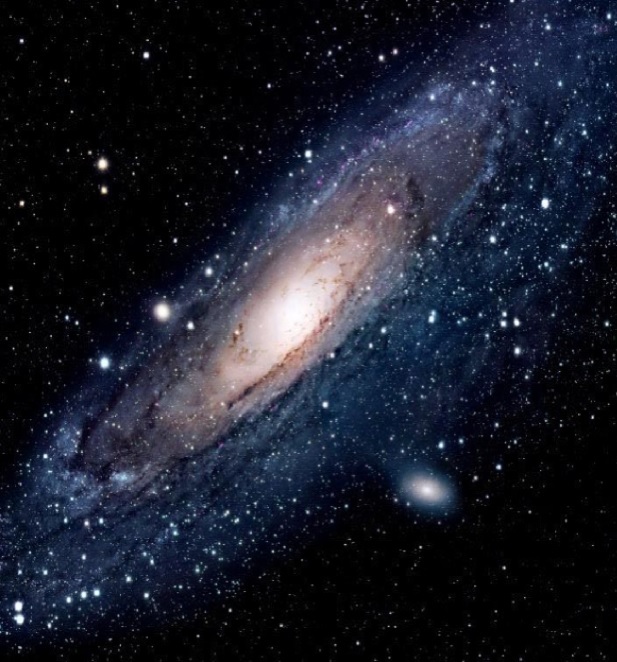 Our galaxy, the Milky Way, is on a collision course with neighboring galaxy M31, Andromeda. Careening towards each other at a rate of three hundred kilometers a second, the galaxies will collide in about two to three billion years. One hundred years ago, let alone even fifty years ago, this was not known. This incredible thought and the notion that Earth is but a tiny part of a galaxy with billions of stars and systems is a relatively contemporary fact. Within the span of fifty years during the twentieth century, humanity went from learning how to fly an object to landing on the moon. Suffice to say, from the discoveries of the observable universe, space exploration, and quantum physics a cosmological reconfiguration has occurred. However, this time has brought immense destruction to the planet including, but not limited to, global warming, ocean acidification, and deforestation. In Western cultures, nature and environment are considered more of a resource, separate from humans and culture. Despite the ecological degradation that has caused the Anthropocene and this perceived separateness of nature and culture, there is a remarkable exploration towards a unified theory of everything. The discoveries of understanding the immensity of the universe, the origin of stars and planets, and the details of the entanglements of life and the nonliving have brought new realizations on both this planet and beyond. Earth is but a speck, or rather a pale blue dot (Sagan, 1980), in the vastness of the Cosmos. All of this space is entangled from the same beginnings, merely assembled in various contextual configurations of space and time. In this concept is the basis of life, agency, matter, and an inspiration for a hopeful visioning of the future. This search for an understanding of space and time— the theory of everything—is not limited to cosmology, but can be pursued by the practice of sustainability education. My approach reflects a more integrated view of humans that is influenced by the cosmos. In challenging times, such as this era, sustainability education can look towards the future through hopeful pedagogies of interconnection through reciprocity, storytelling, and embracing the bio-cultural diversity of Earth. We discuss Anthropocene in sustainability education with the intent of pointing out the destruction humans have caused and changed on this planet. We talk of saving nature, conserving nature, and maintaining nature for the sake of humanity—for food, shelter, home, recreation, resources, and justice. In the late 1980s and through the 1990s, the time I was in grade school, myself and fellow students were told to ‘save the rainforest,’ recycle, and to also ‘save the whales.’ Regarding conserving my backyard, not so much. The orientation my peers and I had towards the planet was almost a disembodied awareness that humans were causing destruction, but it wouldn’t affect us directly (nor were we responsible). However, we enacted and were situated within this impact. Just like today, we drove cars, played with plastic toys, and participated in a capitalistic market economy. Humans are still very much situated with our impacts on the Earth. While our relationship with greenhouse gasses was almost a passive one, as children we could not understand the ethical complexity of greenhouse gases, the great pacific garbage patch, or ocean acidification let alone be aware of a “carbon footprint”. I remember the early and mid-1990s as a time of hope that my generation would sustain peace and save the environment. Simultaneously, we were a part of a culture of anthropogenic destruction and the Anthropocene. There was, and often still is, a fundamental problem with environmental and sustainability education of the save the world paradigm; it lacks relatability and places lofty and far-reaching solutions to problems in the future (e.g., the children are our future; save far off places of Earth). As David Sobel (1996) noted, apathy towards environmentalism and ecophobia can be among the results of an overwhelming approach towards convincing people to save the world, let alone casting children as saviors. Along with this overwhelming task of ‘saving the planet’ is the human centered notion of these anthropogenic practices and the Anthropocene. This human essentialism, that humans and only humans have created a geologic epoch, and humans alone will shift it, reiterates the very logic that has led to anthropogenic destruction in the first place. Nor does Anthropocene and lessening our footprints consider the full scope of the ideological and market based causes of this era. I am writing this in the liminal state between the US presidential election of November 2016 and the eventual presidential inauguration of Donald Trump on January 20, 2017. The morning after the election I saw a European friend on social media post “welcome to the Trumpocene.” In this time, I fear for the progress of intellectual advancement, energy, and the fight against climate change. With Hillary Clinton, the United States would still have been in the hands of capitalists, but still there likely would have been movement towards sustainable energy. Now, protecting and safeguarding the planet through the US government is an uphill challenge, at least for a few years. The Trumpocene is an ideological era. It means that not only must those who teach or work in sustainability must contend with the Anthropocene but must cope with runaway capitalism and popular fascist ideologies. This era risks the re-colonization of those who look different, to the neo-colonization of Earth. However, power of change is not top down; changes can be made through actions (e.g., in education, grassroots organizing) and relationships amongst people, dismantling hierarchies and reconfiguring this era. Yet what I fear most is the impact this administration will have on fueling the Anthropocene and the growth of unequal capitalism. This era can also be described as the Capitalocene (Moore, 2016), during which the Anthro and Capital will grow, and at great cost. Resistance is necessary to subvert the hegemony of this era. Not all is for naught. Focusing not on what humans are and can do, but on how humans are in the midst of entangled species, cultures, natures, and the Cosmos may offset the human as savior complex. This shift in perception of place has the potential to support development of an ethic of care first towards one’s immediate orientations of the space we inhabit, which then may be expanded towards to larger picture of the whole planet. Donna Haraway (2016) urged that Anthropocene be used only in the short term, that we not become fixated on the stuck epoch of Man. She called for a new visioning that embodies the more-than-human – Chthulucene. Chthulu, from the ancient Greek word chthonic (meaning, of the Earth), is a many tentacled being, interconnected and inseparable. It is a fantastical rendering of Gaia, or of other such non-western notions of the Earth as more than resource or rock but living and vibrant being[i]. Within this scope, I cast here an embodied ethos towards sustainability education. Drawing from my ethnographic research on the embodiment of place, I have come to note hopeful steps of a future vision beyond the Anthro-capital-trumpocene. A broad view is taken here, but these steps can be taken in the most minute of places to creatively explore our place in the Chthulucene. These steps focus on an embodiment within place, from one’s immediate surroundings to the greater expanse of the Cosmos. While these are more philosophical suggestions that rely on the intimacies of place, they are intended to inspire and create in various educational contexts. Reciprocal relationships are developed by being in a place with awareness of the nuances, agency and scale of place, and the various responses and reactions from human body to more-than-human features. Knowing a place means learning about it, the stories, the features, the embodied experiences while allowing place to respond and teach us to move in, respect, and reciprocate. This includes learning the nuances of ecology and geology, the weather systems, where the sun rises and sets, where the water runs or does not, how it changes in moments of the day or seasons or how the cosmopolitan features of human development snake throughout land and construct livable areas. Learning the intimacies of place allows for the humbling knowledge of a human’s role in place to emerge. Importantly this respects the diverse meanings humans make of place, such as traditional ecological knowledge (TEK). About bio-cultural diversity and reciprocal relationships, TEK is valuable in that it is adaptive and does not see the world as a static place (Berkes, Colding, & Folke, 2000). Understanding the practices, such as TEK, necessary to live (and sustain life) in environments may help to develop means of continuing to live on this Earth in a manner that adapts (and does not destroy). This utilizes accumulated experiences, wisdom, and living in an intimate relationship of balance and harmony with local environments (Settee, 2008, p. 45). These relationships can be cultivated by sitting or walking, from urban settings to “wilderness”. In this practice, we may see the more-than-human nature less a resource and more as kin (see Abram, 1996; Apffel-Marglin, 2011; Wattchow & Brown, 2011). What stories are told of a place and how? Storytelling is about responding and discussing the embodiment of the place – not what it is, but how it is in dynamic discourse (not relegated to only words). What are the meanings for this place through various and multiple perspectives? How are the meanings and multiple identities of place told through indigenous cosmologies, stories, folklore, oral histories, traditional ecological knowledge, religion, and sacred-landscapes? What does the scientific method teach us of this place (through disseminated science literature)? What do other disciplines share of place as well– anthropology and social sciences? How do the arts respond to this place and make meaning through visual, media, and music? What does these stories express of this place and how do you learn more about it that way? These stories are not what humans do, but what humans have done within place (see Bowers, 1995; Bowers, 2006; Greeson & Loney, 2016; TallBear, 2015; Pitts-Taylor, 2016). Understanding multispecies relationships (amongst human/more-than-human) can lead to awareness, subversion, action, and intervention. What other species teach humans through encounters and relationships, allows humans to understand ourselves as dynamic actors in the diverse configurations of nature and culture. This can allow humans to be more aware of reactions to other species and from that examine and change behavior. It can help an educator pose questions to students that challenge assumptions of what it means to be human. Multispecies encounters can lead to an understanding of the agency of more-than-human (Kirksey, 2014). In this essence, such infrastructures of the planet, like mountains or urban centers, are far less than static structures in the background of the human story. This is a dynamic engagement of the Cosmos and life. The suggestions above have a common theme – understanding the diverse context of place, which involves multiple perspectives of humans and more-than-humans. There is not one dominant voice or experience that essentializes meaning. Embracing a hopeful experience of place in the Cosmos is reciprocal. Humans must start with respect within this entangled Chthulucene. Humans cannot go back in time. Yet in a sense, we can time travel by looking at stars burned out in galaxies far away, but bright in our own night sky. What do those stars tell us or remind us? That we are part of a far more complex and entangled existence that the anthropos and Trumpocene would have us realize. We are all stardust, time traveling to possible futures. I use this to envision what is not yet here. As Rosi Braidotti once remarked, “the yearning for sustainable futures can construct a liveable present” (2012, p.192, emphasis added). The future is now. What is done now is the future. This lens can be uncomfortable, challenging, and woeful. But it is what is needed. This perspective and my suggested steps are risky, there is not a known outcome! But what is known is that the future won’t be the same. I’m imploring us, sustainability educators, to shift our norms. It is the Anthro-capitalocene on the eve of the Trump era. What other choice is there than to reconfigure the human perception of place and understanding of entanglements? Amid this confusion in the precarious positioning of the Holocene’s thresholds of sustainability amongst calls for resistance and rebellion there is one notion that cannot be left out. That is hope. Abram, D. (1996). The Spell of the Sensuous. New York: Vintage. Apffel-Marglin, F. (2011). Subversive Spiritualties: How rituals enact the world. New York: Oxford University Press. Braidotti, R. (2013). The posthuman. Cambridge, UK: John Wiley & Sons. Bowers, C. A. (1995). Educating for an ecologically sustainable culture: Rethinking moral education, creativity, intelligence, and other modern orthodoxies. Albany, NY: Suny Press. Bowers, C. A. (2006). Revitalizing the commons: Cultural and educational sites of resistance and affirmation. Lexington Books. Haraway, D. J. (2016). Staying with the trouble: Making kin in the Chthulucene. Durham, NC: Duke University Press. Kirksey, E. (2014). The Multispecies Salon. Durham, NC: Duke University Press. Moore, J. W. (2016). Anthropocene or Capitalocene? : Nature, history, and the crisis of capitalism. Oakland, CA: PM Press. Pitts-Taylor, V. (2016). Mattering: Feminism, Science, and Materialism. New York: NYU Press. Sagan, C. (1980). Cosmos. New York: Random House. Settee, P. (2008). Indigenous Knowledge as the Basis for our Future in Nelson, M. K. (2008). Original instructions: Indigenous teachings for a sustainable future. Rochester, VT: Bear & Company. Sobel, D. (1996). Beyond Ecophobia: Reclaiming the heart in nature education (No. 1). Orion Society. Van Dooren, T. (2014). Flight Ways: life and loss at the edge of extinction. New York, NY: Columbia University Press. Wattchow, B., & Brown, M. (2011). A Pedagogy of Place: Outdoor education for a changing world. Clayton, Victoria: Monash University Pub. [i] Haraway wrote: The brand of holist ecological philosophy that emphasizes that ‘everything is connected to everything,’ will not help us here. Rather, everything is connected to something, which is connected to something else. While we may all ultimately be connected to one another, the specificity and proximity of connections matters—who we are bound up with and in what ways. Life and death happen inside these relationships. And so, we need to understand how particular human communities, as well as those of other living beings, are entangled, and how these entanglements are implicated in the production of both extinctions and their accompanying patterns of amplified death. (Van Dooren, 2014, p. 60 in Haraway, 2016, p. 173).